Is This The Porsche 911-Fighting Mercedes SLC? Mercedes has been developing a new car to fight the Porsche 911. We know this. But is this what it will look like? 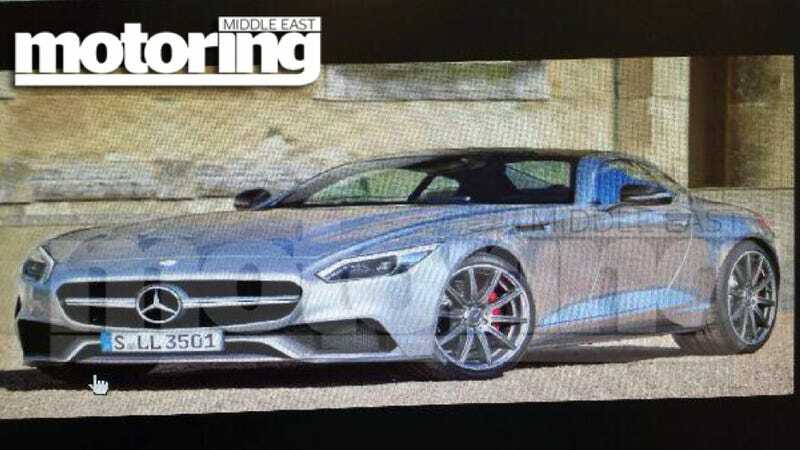 This shot, which comes from Middle East Motoring (head over there for a shot of the rear), is purported to be a brochure scan of Mercedes' upcoming smaller sports car. They say the car will go on sale in 2015 as a 2016 model. If that's the case, is the design already finalized? Not to harp on an old subject, but we did show you the design of the 2014 Corvette in 2011. The timeframe here matches perfectly. Where I have an issue is saying the claim that these are brochure scans. In what world would a car that isn't going on sale until 2015 have brochures printed long before it's unveiled? As far as I know, printing is a fairly quick process. Also, there is no need for brochures, printed or digital, for a car that doesn't even have a date to be released. So I'll take this for what I think it is: An educated rendering of Mercedes' sports car. I don't think it's the real thing, but I figure it could be pretty close to what we end up seeing in the flesh... whenever the car is unveiled.